A Roman, studied at the Righi school and at La Sapienza University, was in the corps of the Parachute Regiment in Lebanon, married and divorced with two daughters Benedetta and Flaminia. Vincenzo Moccia started his career working in precious metals for petrochemical companies. His first managerial post was as Treasurer of Mercedes Benz's Financial Company and later as Chief Financial officer. These Posts he would hold again with American Express Italy. He contributed to the founding of the Italian Association of Company Treasures during that period. After becoming a Unit director of American Express's travellers cheques division in Italy, he ended his experience in finance on joining Bulgari's sales and marketing division. There he was responsible for strategic planning and of restructuring the Group's logistics. Thereafter he became head of the retail area in Italy. He later covered the same assignment for Gucci until Dior named him General Manager. Comforted by its figures, Italy's nautical industry is continuing to register a positive trend specially when it comes to brands which focus their production in the Super Yacht market bracket. This growth is certainly changing the looks of a lot of our shipyards which are becoming more and better structured to meet the needs of the numerous orders and of those that will hopefully come. There are bigger, more specialised and efficient production plants manned by a gradually increased number of personnel sometimes led by managers coming from different business sectors. 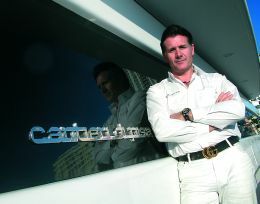 In this respect Vincenzo Moccia is a typical example, because before he touched base with the world of Super Yachts as a Sales, Marketing and Communications Director of Camuzzi Nautica, he had acquired considerable experience in finance, marketing and sales in prestigious firms operating in different fields including the fashion and jewellery business. 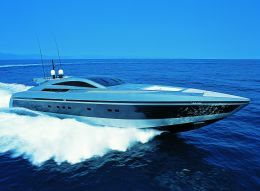 When and how did Vincenzo Moccia land in the Super Yacht world? 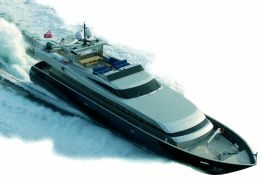 I was toying with the idea of becoming involved in the nautical industry when Ruggero Massimo Jannuzzelli spoke to me about the Camuzzi Nautica project in July 2004. In light of the high profile of its shareholders and the high quality of the project, I couldn't refuse and found it all very stimulating. I liked the idea of this new experience in a sector which was professionally new to me, and of working again, after the marvellous period in Bulgari, with Italian shareholders. Above all I was highly intrigued by the challenge of bringing emblematic quality brands of Italy's shipyards back into the international lime light. At the end of September of the same year the purchase of Baglietto was completed and in the following January I also joined the company. An obvious question but I must ask you what differences you found, at least in terms of production, between such diverse areas as fashion, jewellery and Super Yachts? I can start by saying that within Baglietto I found in Gaspare Borghini a very valuable person not only as an entrepreneur but also as a manager who had already started to re-launch the brand name by himself. My becoming part of what was his shipyard and a baby of his to all effects and purposes could theoretically have been one of the potential difficulties of my new job. With Borghini, instead, I immediately set up an excellent relationship, he is furthermore a great communicator. We were thus able from the outset to establish the right feeling which proved to be fundamental in achieving the shipyard's excellent results in 2005 both in terms of revenue and of new orders for the coming seasons. 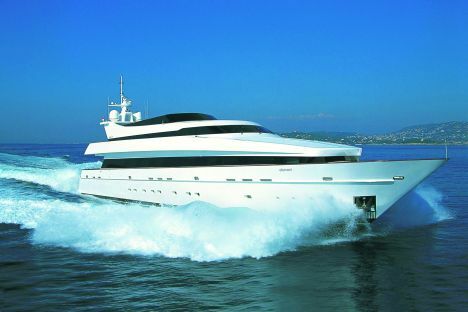 It was he who in fact asked to bring into Camuzzi Nautica managers from other business spheres, maybe because he didn't see any fitting the bill in the yachting business but I believe it was mainly because he was looking for people capable of bringing something new, a different way of working and organising. A farsighted Mr. Borghini an innovator. An innovator though who started, after the dark years preceding his takeover, by giving his shipyard very precise guidelines in total respect of the Baglietto tradition which is to build boats well. Borghini always insisted on productivity, excellent building quality, respect of the terms of delivery which are some of the factors which concretely enabled him to restart the shipyard. It was his idea to introduce and give a lot of importance to your series of fast boats. Given the success it has had, I would say that it was a winner. Undoubtedly, specially if you consider that the slower motor yachts are ships that also follow specific guidelines wanted by Borghini and that they represent the bulk of our present and future production. What is then the added value that Vincenzo Moccia has brought to Camuzzi Nautica? That of introducing a culture of luxury of a certain type of absolute exclusive luxury which I developed in my previous experiences with regard to traditional marketing practices and in the approach and contact with customers. These matters together with communication and financial aspects of the business are managed directly by the Holding Company by Camuzzi Nautica and not by the individual shipyard. Therefore the shipyard must only concentrate on its production? Exactly, the shipyard is responsible for the production they must only focus on building the yachts well and deliver them on time whilst the Holding Company constantly, interacting in every way possible with the yard is responsible for all the other aspects which in the end are at the core of the business. This entails a great deal of specialization in every field, including management, which revolutionizes what is an accomplished fact for many national shipyards which are mostly run by a one man show who is an entrepreneur and at the same time a manager who centres everything around himself. We take advantage of our streamlined structure even if it will have to grow. A few highly trained men with specific tasks in their field with each one contributing his own added value. Being a team of a selected few allows us to discuss matters frequently, meet more easily, I'd say nearly every day, and take more rapid decisions in respect to the market, our clients' needs and the competition. This enables us to react to events and situations rarely found elsewhere. Which takes me back to your question on the differences between this world and that of the fashion business, I recall having had in previous experiences an articulated structure, as in Gucci's case where I was leading a group of as many as 300 people, which is probably the greatest and more evident diversity between the two worlds. If a manager is at the head of a large structure it in fact gives him more tranquillity whereas with a restricted number of people to count on, it is more involving, one has to be totally dedicated particularly when having to organize a special type of work starting almost from scratch as was the case at the beginning of my days in Camuzzi. Such a situation however can clearly give one a far greater satisfaction. Particularly when success is attained quickly. In view of the fact that we succeeded in doing in eight months what we thought would take three years, it is certainly true in our case. I must say that we've been backed by the market's positive moment but a hike of 250% in our orders' list is I believe rather indicative of how our group has worked. Were you able to count on a sort of apprenticeship stage in this new experience of yours or did you find yourself in the front line as it were having to face unprecedented problems? I certainly would have liked to have had more time to study the sector and its problems in greater detail but the rapid evolution of our business, the fast growth of our brands and our great success made me become operative immediately whether I liked it or not. I could say that I was happily overcome by sales and completely absorbed by the rapport with our clients but able nonetheless to give an initial imprint to the organisation. As I have already mentioned a selected team was created which is growing but which will still be kept to the essential since our clients are highly selective. Our contacts in real terms over a year are about ten to a maximum of fifteen a number of people which can easily be managed by a restricted team. The important thing is to find the best method to work with to give them the maximum service. What aids are used in such cases? We are working on a database which will let us manage our yachtsmen at 360° that will give us practical and organizational support in our conduct of business matters. We are building customer care units in Montecarlo that will provide for a better management of all the aspects tied to the after sales services. We are about to launch a number of events involving our clients to make them feel closer still to the brand name. Maximum care therefore of the boat but also of the client. The client must not only be satisfied but delighted and to achieve this one must understand everything about him. The mistake one makes very often is to measure oneself with one's team trying to interpret what the client's needs could be without worrying for example of what the client thinks of you. One must identify oneself completely with the person, with his lifestyle, with his way of being so as to offer him solutions and answers before he asks for them. Working with a method. By structuring for example all the inputs I get. I'm in daily contact with brokers, surveyors, colleagues, clients etc. and because of this I continuously receive feedback, which if well used can make a substantial difference in my job. The feedback is gathered, monitored and matched with our customer database where our old and new customers are divided up even by product. The result is that we always have an updated picture of every situation which is an excellent starting point to work from. What is luxury in your opinion? Generically its exclusivity something which is not in everyone's reach. Does that mean that every thing that has a high price is luxury? No, its not like that. There is luxury and luxury in as much as there are expensive things which are in most cases prohibitive but as such don't represent the type of luxury that we seek. Camuzzi Nautica operates in a market niche which I could describe as rarefied, but that is present in the exclusive niche of Super Yachts. Giving you an example as a "fashion man," as I hear I'm defined sometimes, can a "boutique" of a top brand which can count on eight thousand incomers everyday be considered a luxury "boutique"? Someone may answer you affirmatively but it certainly isn't the terms of our comparison. You are more of an atelier then? Yes, an atelier, for clients of Super Yachts. We naturally also need a certain number of incoming clients to make our business work but they way we build boats and relate to the client is completely different. I'll give you another example which is even clearer because I'll refer to a cult brand of the "Made in Italy," Ferrari. When Ferrari, which is under everyone's eyes, decided to increase the number of cars produced to benefit its coffers it lost its sceptre as exclusive car maker and handed it over to other brand names. These other brands more than being industries are entities of true craftsmanship often less known than Ferrari but which indeed produce very few cars concentrating on quality and above all on what the owner really wants which entails building a car made to measure in every detail. This makes the car unique and is only the owner's, period. Ferrari however to keep its brand's positioning at the top of the high market segment, still, according to a focused strategy, continues to produce some models of extremely limited numbers which are absolute customized jewels of tremendous expense for very few. Baglietto and I might add Cantieri di Pisa with their due distinctions, have similar traditions based on building great boats in few numbers which have left nonetheless a clear mark on the Italian and international yachting scene. Our yachts achieved fame for their seaworthiness, elegance in design, perfect furnishing, absolute comfort and customization strongly placing them in the exclusive luxury yacht field and we will do our outmost to keep up this tradition inherited from their history. We absolutely do not intend to disrupt the essence of our brands but to the contrary we want to continue with that philosophy by building a limited amount of examples tailored made for our clients. In short our way of proposing luxury is to make our yachts exclusive, each being uniquely different from another. To increase production capacity can become counter productive, in certain cases, then? At certain levels probably yes. Moving from 10 to even only 50 yachts a year would noticeably reduce the appeal we have on several clients who might go and look for their concept of luxury and exclusivity elsewhere. Unless we invested in astronomical structures we could not produce more yachts and maintain our usual standards, our after sales services would not be as efficient, our rapport with the client would no longer be at 360° and who has to buy a yacht knows this. It's difficult however to make a shop profitable with only a few clients. To make profitability tally with top quality, exclusivity and customization of a certain type of product such as a Super Yacht, certainly isn't easy but we are proving that we can do it. What differences are there between Baglietto and Cantieri di Pisa? Their products are complementary because they both work in the luxury market but they differ by type, performance and above all in the choice of the building material used. Each of them has its unmistakeable elegant design which can go through time without loosing its beauty or having to meet with trendy fashions since they both have always aimed at quality, technology and on continuous research for the product's improvement. These brands, for the aforementioned reasons rely on their clients' loyalty. There are examples of owners who have bought from the same shipyard three or four motor yachts and that would never change brand. Cantieri di Pisa and Baglietto, each one in his own field, have meant the top of the top for many years in Italy and this is why they were chosen by Camuzzi for its business in yachting. Are they shipyards that have the same type of clients? They are complementary in this too because they aim at a target which has a lot of affinity but is quite distinct. If it is possible for a yachtsman to change from a composite laminated motor yacht as is a "Pisa" to a Baglietto in aluminium, I'd say that the opposite happening is unlikely. In marketing terms do they need a different approach? Our work method starts from the same matrix because belong to the same super luxury niche so the marketing process is practically identical. It is up to us to understand through an analysis of the potential buyer which is the best product that corresponds to his exact requirements so as to help him in selecting it. There are loyalty retention events scheduled but it is above all thanks to the quality that we are able to produce in our motor yachts that will ensure brand loyalty. Then also marketing of the brands image will contribute to make our clients proud in being identified with us.